In contemplating what constitutes an affordable set lunch, Novus (with its $28/$38++ 2/3 Course Set Lunch) would definitely not be one of the few places that comes to mind, especially when more established players such as Gunthers, The French Kitchen and Au Petit Salut charge at similar if not cheaper rates. Yet, located just opposite SMU, it was one of the few restaurants I could afford to dine at without being (too) late for my next appointment…a project meeting during recess week sighs. 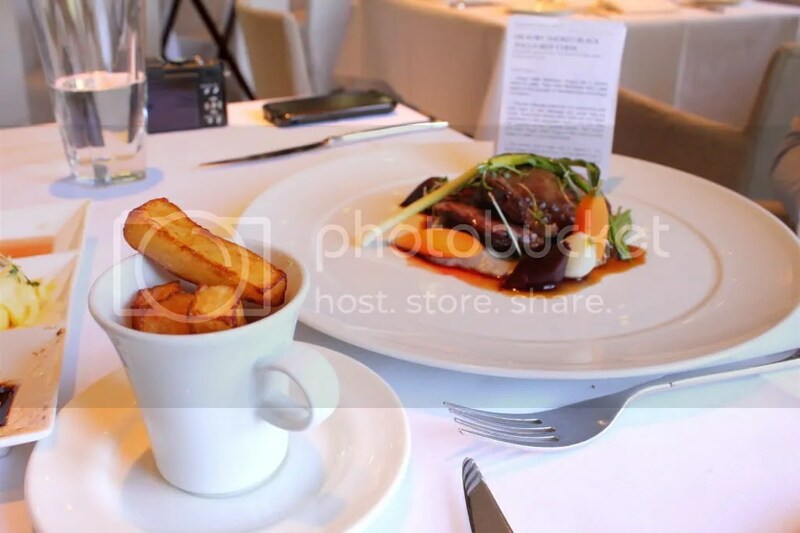 With a cuisine that borders on the contemporary, would Novus prove itself to be an avant-garde in French cuisine or simply all sizzle and no steak? 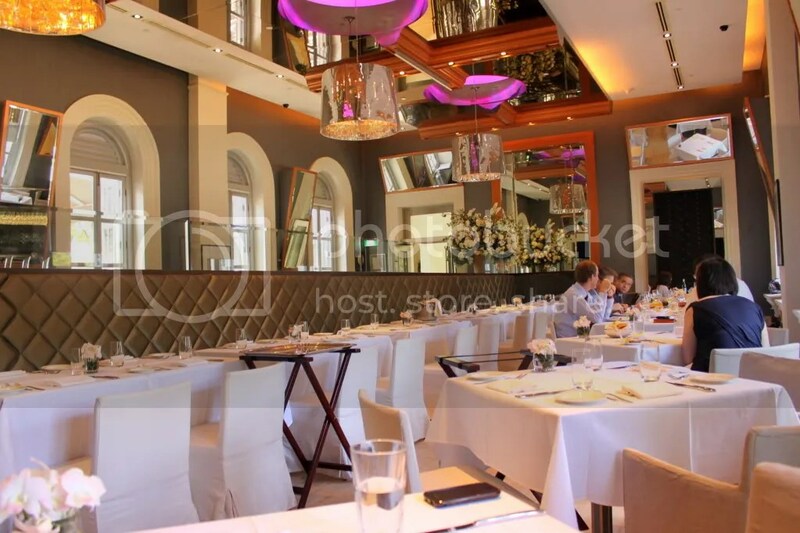 Located within Singapore Museum, Novus is separated into 2 dining segments; the Restaurant & Bar for fine dining and the Cafe & Courtyard for casual dining. I was initially led into the cafe when I asked one of the waiters if that was Novus but quickly realised the mistake upon seeing a menu consisting mainly of sandwiches and pastas. While the Cafe & Courtyard had an open concept with the optimal use of natural sun as lighting, the Restaurant & Bar had a more private feel to it. After settling down inside the restaurant, my friend Raina and I were only given the set lunch menu after probing the staff, who had previously provided us with simply the ala carte menu. When passing us the menus, somehow the waiter had a nonchalant and unapologetic look that severely irritated me, and it didn’t help that service remained crappy throughout the meal as I will describe in vivid detail later. Raina and I had the 3-Course Set Lunch at $38++. I thought that the selection of mains available was pretty decent, ranging from angus beef cheeks, duck confit, snow cod and trio of berkshire pork belly, pork cheek & pata negra ham just to name a few. 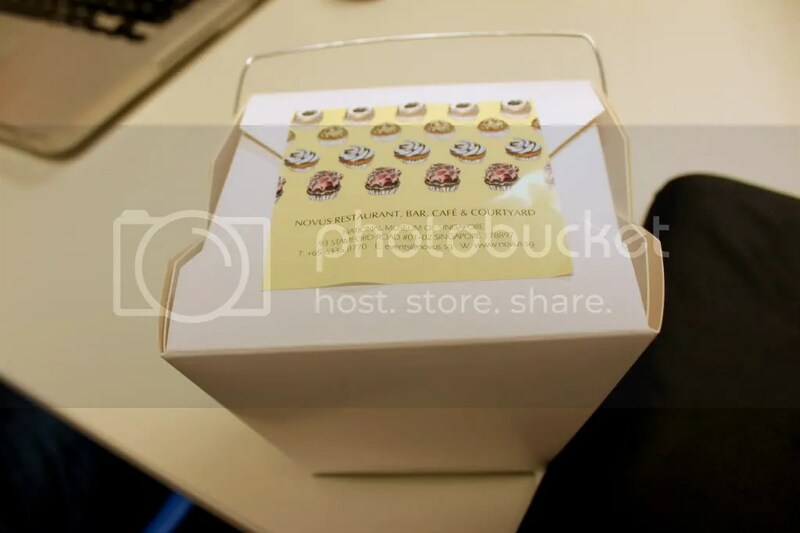 We were first served a basket of complimentary bread which I found so-so. 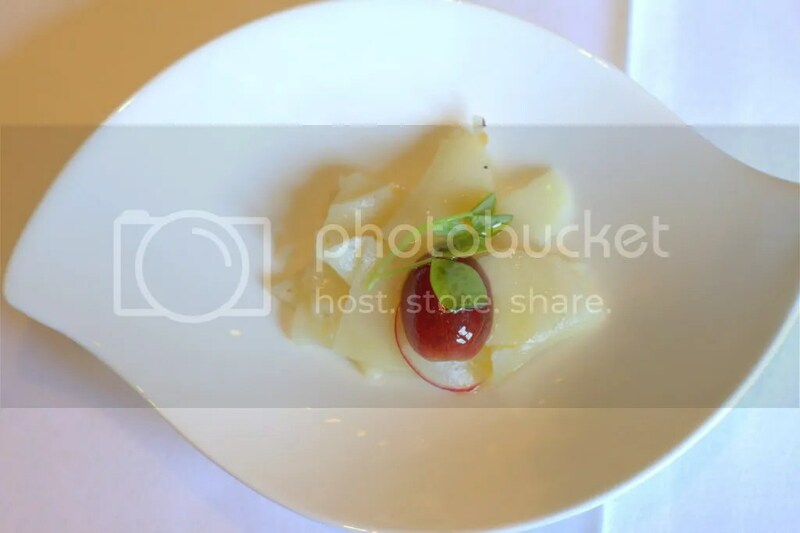 For our complimentary amuse bouche, we were served Heart of Palm with Grape in a Vinaigrette dressing. A bit too acidic for me since I hadn’t had my breakfast then. 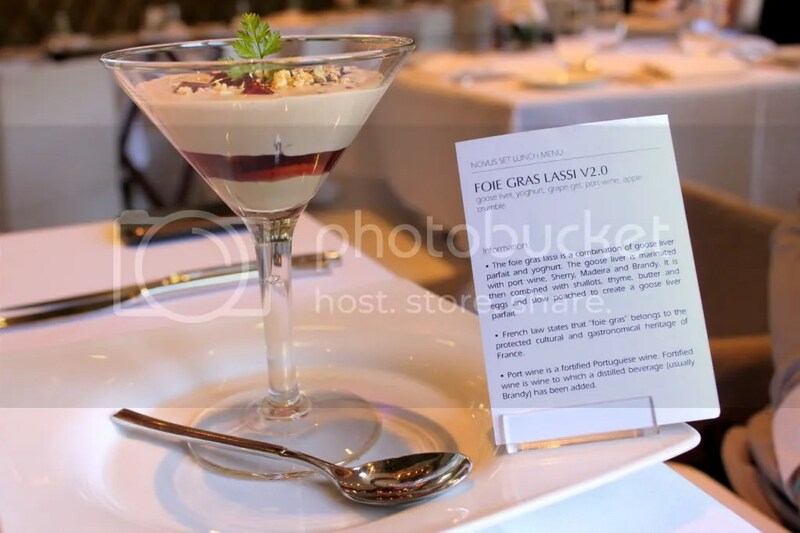 For appetizer, the Foie Gras Lassi V2.0 was a combination of goose liver parfait and yoghurt. Something interesting about Novus is that it provides a small information card along with the courses as they are served (very much aligned with the museum theme which has information stands for each exhibit) and it went as such: “The goose liver is marinated with port wine, Sherry, Madeira and Brandy. 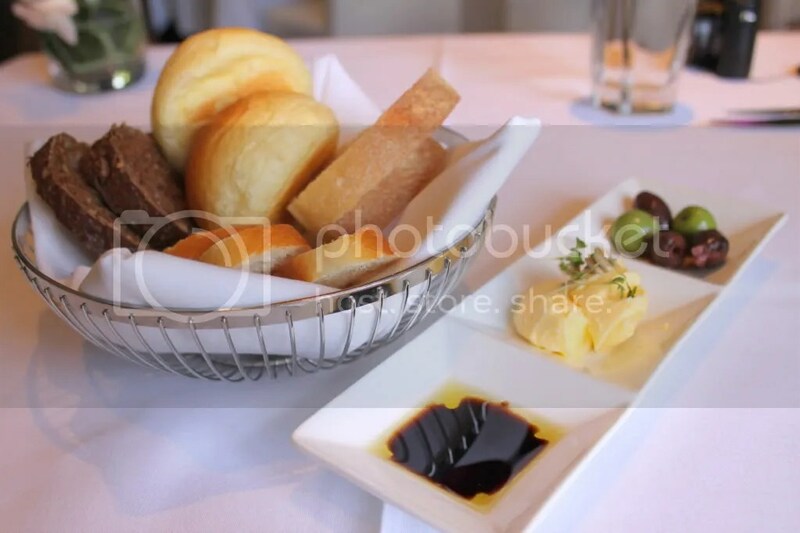 It is then combined with shallots, thyme, butter and eggs and slow poached to create a goose liver parfait”. 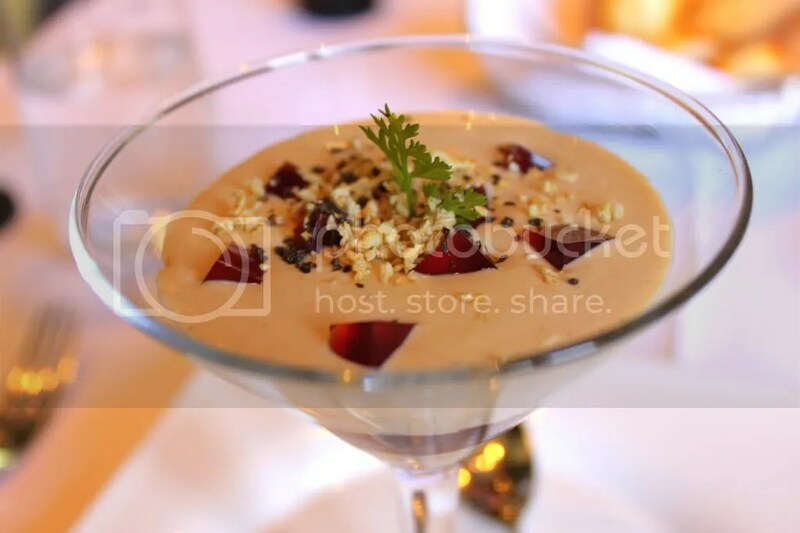 While the combination was good, I would have preferred if there was a greater accentuation of the foie gras, as the lassi overwhelmed it somewhat. 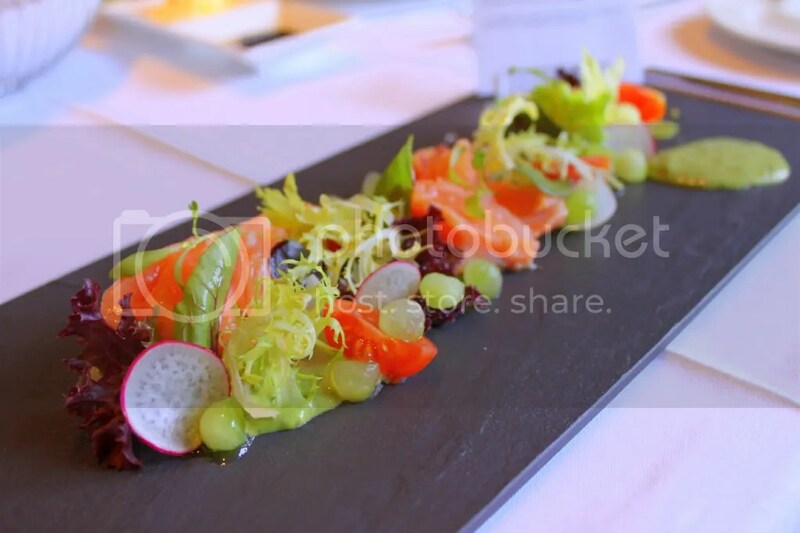 When I saw the Norwegian Salmon treated like a Salad, it totally reminded me of the Tuna Carpaccio Salad I had at The Lighthouse @ Fullerton Hotel just a few months back, think it’s because the same black serving platter is used. For this dish, the Salmon was cooked sous vide, meaning it was cooked under low temperatures over an extended period in a vacuum, thus allowing the salmon proteins to remain intact and keeping the fish tender. As such, the Salmon tasted much like sashimi which I found very gratifying. 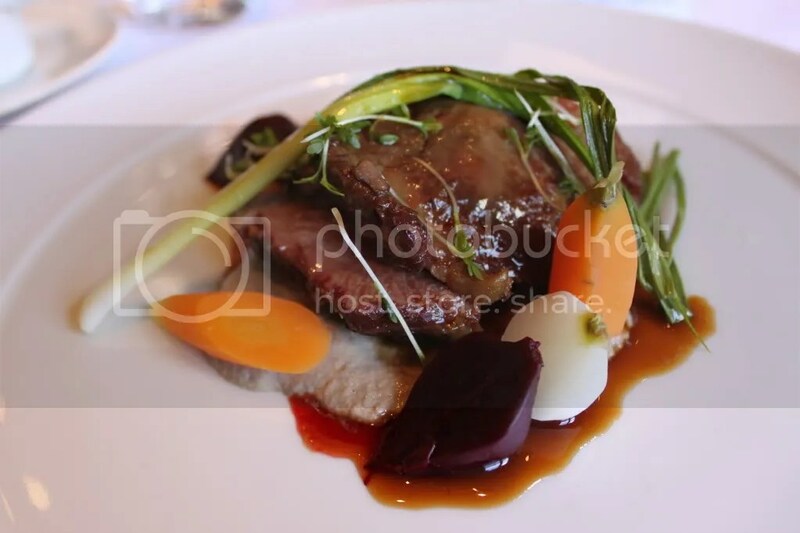 For Mains, I would highly recommend the Hickory Smoked Black Angus Beef Cheek. The beef cheeks were tender as butter and went amazing well with the mushroom creme. The portion was also rather generous. My only grouse is that it wasn’t served warm enough. The Triple Cooked French Fries that came along with it was really tasty as well. 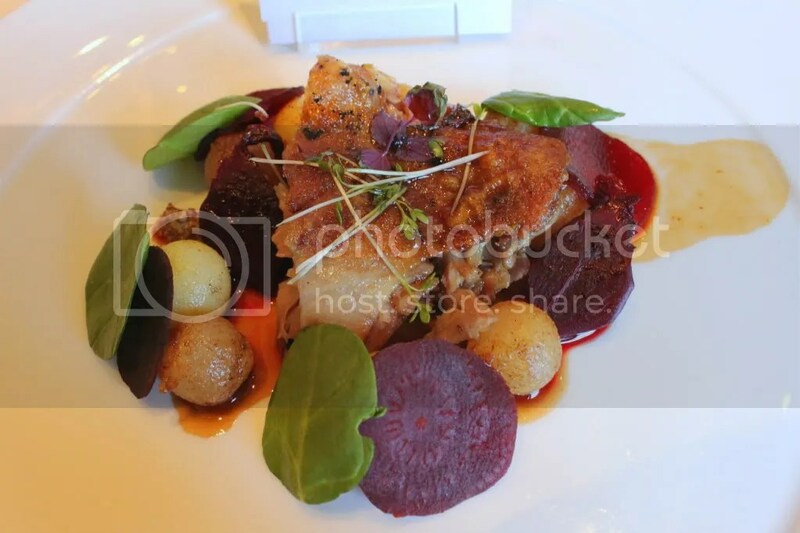 As for the Crisp Duck Leg Confit, the portion was rather miserable though it could be due to the fact that it was deboned and hence looked unsubstantial. The duck meat was moist and tender, better than most of the duck confits I have come across for this aspect though this came at the expense of a skin that was not as crisp. For Desserts, the Fruit Jelly sounded novel with the description “Assorted Berries & Fruits in Champagne Jelly & Elderflower Sorbet”. Unfortunately, it was really unpalatable and I gave up after 3 small spoonfuls. The jelly was really sour with an aftertaste of wine gone bad and the Elderflower Sorbet was exceedingly too sweet for one to bear. 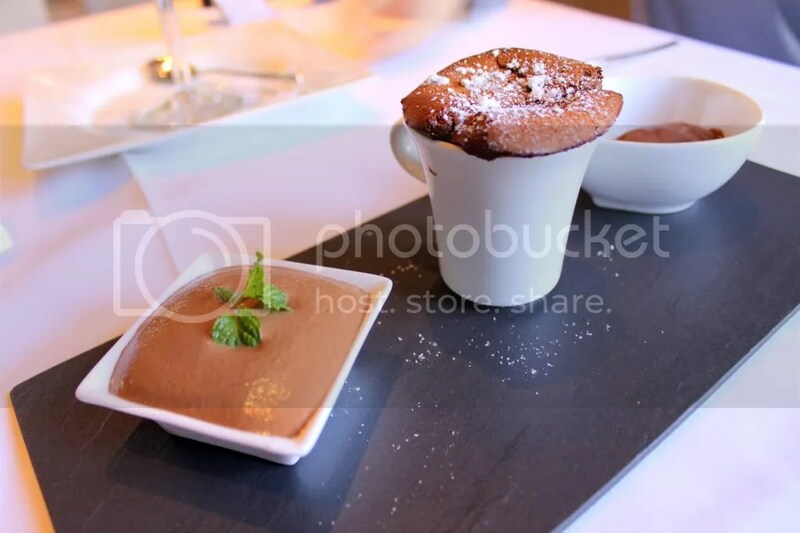 Chocolate Test had the description “50% souffle, 68% Mousse, 80% Sorbet”. No idea what that meant, perhaps that’s the optimal proportion in which we are to eat them together for each mouthful? Unlike the fruit jelly, this was really outstanding. I dare say it’s even more enjoyable than the chocolate souffle at Laurent Bernard’s Chocolatier, which is the benchmark to beat in my opinion. While the food was a mix of hits and misses, I’d like to reiterate on the dismal service standards here as mentioned earlier. First, menus not distributed properly. Second, waiter didn’t bother to write down our orders and had to come back amidst the meal to reconfirm our dessert orders. Third, request for warm water was ignored and cold water was served instead which we quickly corrected. Fourth, friend’s cup remained empty for a really long duration. Fifth, diners (not exclusive to ourselves) were left unattended with no staff in sight over quite a few occasions and during the few times where staff were present, they often missed out our desperate cries for attention. Sixth, my query on what sauce was used for the Salmon Salad was dismissed quickly with a “Basil” which was definitely erroneous as it sure didn’t taste like it. Seventh, the waiter stood by using eye power instead of pulling out the chair for my dining partner or me, and not offering an extra chair to put our bags (I was lugging 2 bags and a laptop). Not that I’m being a snob or fussy pot (much), but there’s just a basic level of service you’d expect to be accorded with when dining at a “fine dining” venue which was evidently lacking here today. 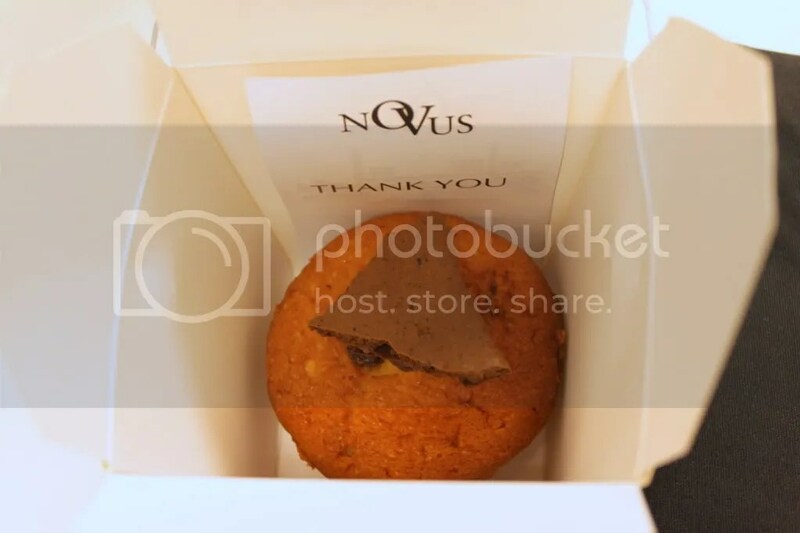 Ok, just to add some balance to my critical comments, a plus point for service is that Novus gave out a free muffin each to every diner, in a nice box with a Thank You note inside. Ate the muffin for supper at home, it’s not too bad with a pleasant fruit-cakey taste. On hindsight, food was ok. 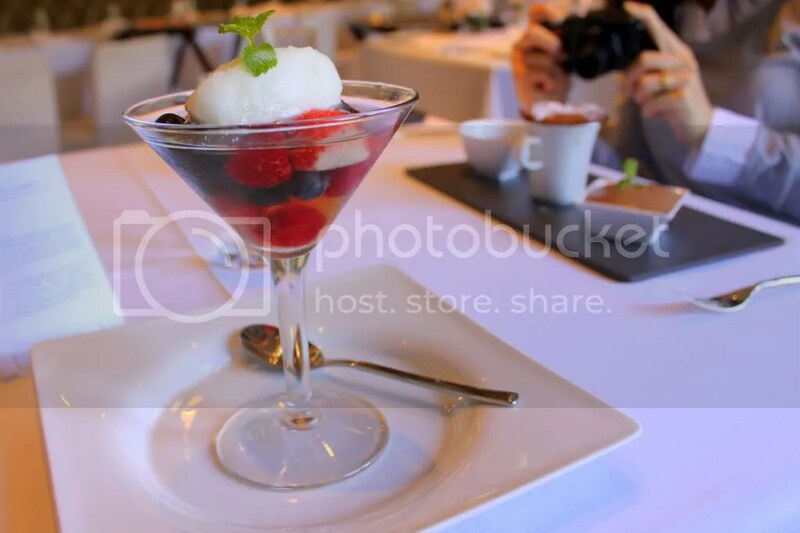 I definitely wouldn’t mind paying $28++ for a 2 course if I could leave out the fruit jelly. 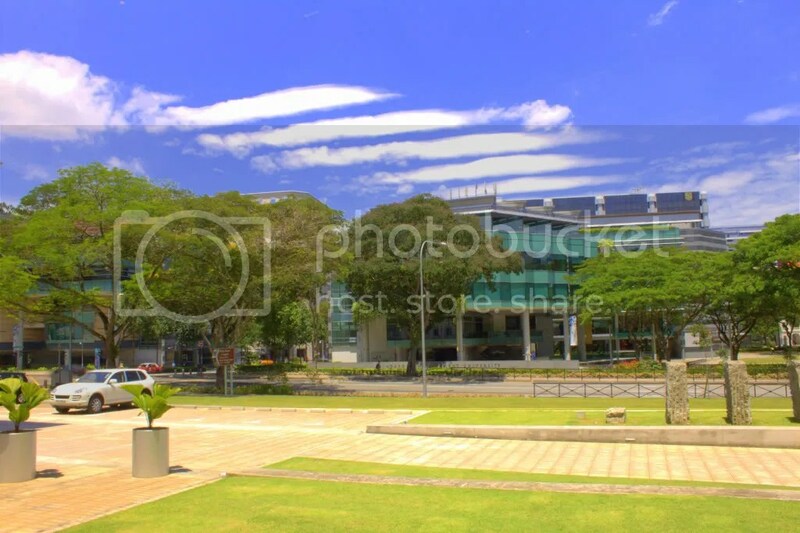 Categories : All YumYums in my TumTum, Chichi, Cuisine Type YumYums, Dhoby Ghaut, French, Location of YumYum, Yummy!